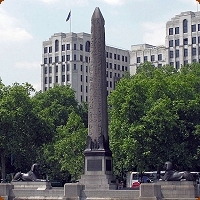 Art & Sculpture: Cleopatra's Needle: Carved from a single block of red granite which was said to have been quarried at Aswan, the obelisk is 68ft 5½ inches in height (20.87m) and weighs 186 tons. Carved from a single block of red granite1 which was said to have been quarried at Aswan, the obelisk is 68ft 5½ inches in height (20.87m) and weighs 186 tons. Thought to have been created as a habitation for one of the spirits of the Sun God, for many centuries it had resided in Alexandria but was given2 to the British in 1819, in gratitude for the British victory over the French Fleet in the Battle of the Nile in 1798 and transported to London in 1877-78 by Sir Erasmus Wilson3 and now stands on the Thames embankment. The needle was first erected in Heliopolis (City of the Sun) by order of the pharaoh Thuthmosis III during the 18th Dynasty4, it was moved to Alexandria (the royal city of Cleopatra) during the last century BC. At the time Heliopolis was considered the Oxford of ancient Egypt, students were brought to read and create hieroglyphs by studying the four sides of the obelisk. The companion obelisk stands in New York Central Park and was presented as a gift to America in 1883 by the Rhedive of Egypt. The obelisk is carved with hieroglyphs praising Thuthmosis and commemorating his third Sed festival. Later inscriptions were added by Ramesses II to commemorate his victories. Around the base of the obelisk are four plaques giving a brief history of the needle. 1. Rose red granite of Syene. 2. Mahommed Ali, Viceroy of India in memory of Nelson and Abercromby. 3. Encased in a iron cylinder, it was abandoned during a storm in the Bay of Biscay. Recovered and erected by John Dixon CE in the 42nd year of the reign of Victoria, 1879.